The Man Booker International Prize has today, Wednesday, 13 March, revealed the ‘Man Booker Dozen’ of 13 novels in contention for the 2019 prize, including two Arab writers. The list includes Omani writer Jokha Alharthi for her book Celestial Bodies (Sayyidat Al-Qamar, published by Dar Al-Adab in Beirut) translated by Marilyn Booth, and Palestinian-Icelandic author Mazen Maarouf, for his short story collection Jokes For The Gunmen (Nikat lel Mosalaheen, published by Riyad Al-Rayes in Beirut) translated by Jonathan Wright. The prize is awarded every year for a single book translated into English and published in the UK and Ireland. Both novels and short-story collections are eligible. Authors and translators are considered to be equally important, with the £50,000 prize being split between them. In addition, each shortlisted author and translator will receive £1,000. The judges considered 108 books. The longlist was selected by a panel of five judges, chaired by Bettany Hughes, award-winning historian, author and broadcaster, and is made up of writer, translator and chair of English PEN Maureen Freely; philosopher Professor Angie Hobbs; novelist and satirist Elnathan John and essayist and novelist Pankaj Mishra. Bettany Hughes, chair of the 2019 Man Booker International Prize judging panel, said: "This was a year when writers plundered the archive, personal and political. That drive is represented in our longlist, but so too are surreal Chinese train journeys, absurdist approaches to war and suicide, and the traumas of spirit and flesh. 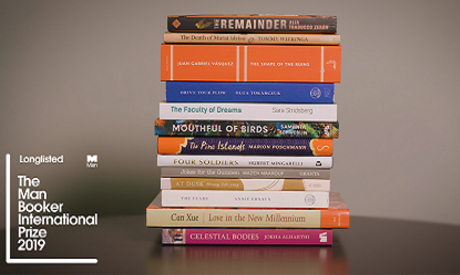 We’re thrilled to share 13 books which enrich our idea of what fiction can do." The shortlist of six books will be announced 9 April at an event at Somerset House in London, and the winner of the 2019 prize will be announced 21 May at a dinner at the Roundhouse in London.